Upon reading these words Paul offers his readers an opportunity to see his great internal struggle as he nears the end of his life. Although the work brings him great joy as he writes to what he considers to be the greatest fruit of his labor for the gospel, his body is worn and broken from the persecution and suffering for its sake. He knows that both avenues mentioned will bring glory to his Savior, as he has just stated in the previous verse, but if the choice were left to him, he cannot be sure which he would ultimately choose. The one thing he does, he continues to rest in the sovereignty of God, knowing that each breath provides him more time to complete ‘fruitful labor’ (v. 22). As I read these words once again, I am struck that not only do these words paint a picture of this anguish that exists in Paul’s heart, but it also powerfully illustrates two great realities of the gospel. For us, especially as American believers, it is nearly impossible to identify with Paul’s distress. Most of us will never come close to experiencing that type of suffering for the sake of the gospel. However, this declaration, because of the two gospel realities it conveys, should be the same cry of every believer’s heart! So what are those two realities? In the first half of this declaration, Paul proclaims, “To live is Christ!” The verb is is actually only inferred in the original language, giving it a wooden, literal rendering of “To live Christ.” We can almost picture the phrase with an equal sign, like “To live = Christ.” Paul is declaring that the gospel he encountered in Acts 9 has radically transformed every single facet of his life. I think about t-shirts that I see people wearing sometimes. A really good basketball player may have on on that says something like “Ball is Life,” or a dancer with one that says “To Live is to Dance.” When I read a shirt like that, it conveys to me that for that person, that activity consumes their lives. They, as we might say, eat, sleep, and breathe that activity. That activity is more than just a hobby for them, it has a visible stake on their lives. And indeed, for participants in those activities that aspire to participate in those activities at the highest level, or professionally, to a certain degree that must be the case. That activity will determine how they sleep, how they spend their time, how they discipline themselves, how they spend their money, how they negotiate their relationships, how they eat, how they feel about themselves, how they define success, how they view others, etc… Almost no area of their life will be un-affected by that level of commitment. This is exactly the transformation of which Paul speaks. This gospel has not simply added a religious overtone to my life. Paul does not declare a commitment to fanaticism to a certain religious affiliation. He, instead, confirms a real transformation that has taken place within his life. We can understand more about what he means in recalling a similar utterance in his letter to the Galatians: “I have been crucified with Christ. It is no longer I who live, but Christ who lives in me. And the life I now live in the flesh I live by faith in the Son of God, who loved me and gave himself for me” (2:20). Paul suggests that as a result of the gospel, it’s as if he no longer even lives. He identifies so much with Christ that it’s almost as if Christ is living and Paul simply offers a vessel for that to take place. The gospel is not just a religious affiliation or participation in a religion. It transforms us. Utterly transforms us. It affects every single area of our lives. Just like what the slogan on those t-shirts represent, as the gospel continues its work of transformation in our lives, it begins to determine more and more how we live, the choice we make, the way we spend our time, the way we steward our treasure, and the way we utilize our talent. We also learn that we are completely devoted to and dependent on Jesus. Just as Paul declared, so should we, that to live truly is Christ. Just like the first half of this declaration, the second half carries the same grammatical idea. “To die = gain.” Now, for Paul, we are prone to simply nod our heads in agreement, understanding as best we can that Paul greatly desires to be rescued out of the persecution and suffering he continues to face in his gospel work. I have read this statement with that prevailing thought so many times. As I read it again, however, I see something deeper. First, I realize that neither side of this lofty statement has Paul as the focus! Although I’m sure that rest from his suffering holds sway over his thinking to some degree, I no longer believe that is Paul’s greatest motivation. We can see clearly from the text that his greatest motivation is “Christ will be honored” (v. 20) in either his continued life or his death. I believe the second half of this declaration has more to do with exposing Paul’s greatest treasure as a reality of the gospel transformation that has taken place in his heart. The gospel radically changes our perception on what true treasure is! Later in his letter to the Philippians, Paul will share a portion of his testimony. In doing so, Paul will list some of his most prize achievements that he sought to accomplish as a young man. Clearly during that time of his life, before becoming a true follower of Christ, Paul treasured status and religious accomplishments. Paul treasured his own resume, the building of which consumed his life. The gospel had radically changed the treasure that focused Paul’s eyes and life. “Indeed, I count everything as loss,” Paul declares in 3:8, “because of the surpassing worth of knowing Christ Jesus my Lord” (emphasis mine). Notice that word, worth. Everything he used to treasure, in light of seeing Jesus for the true treasure that he is, he now counts all of that as rubbish, trash, or refuse. Not only are those things not to be treasured, they were once consuming him to the point that his eyes were blinded to the true treasure, Jesus! Now his eyes have been opened by the gospel. Now his greatest treasure is Jesus, himself. Paul writes to the church in Corinth, “we would rather be away from the body and at home with the Lord” (5:8). Paul’s understanding of death includes the idea of being with the Lord. Because Jesus exists as Paul’s greatest treasure, to die really does mean gain! This proper perception has allowed Paul to focus all of his resources toward attaining that treasure! If in life, everything he has will go toward honoring Jesus. Paul exudes confidence in this when he asserts, “If I am to live in the flesh, that means fruitful labor for me” (v. 20). In either reality, Paul can be found pursuing his treasure. In this life, he will continue to honor Christ through the transformation of the Spirit and in light of the hope that one day that treasure will be fully realized and attained. In his death, Christ will be honored as he gives his life for the sake of his treasure, and in so doing, will finally realize the hope that fills him in life. This is a picture of the Christian life. 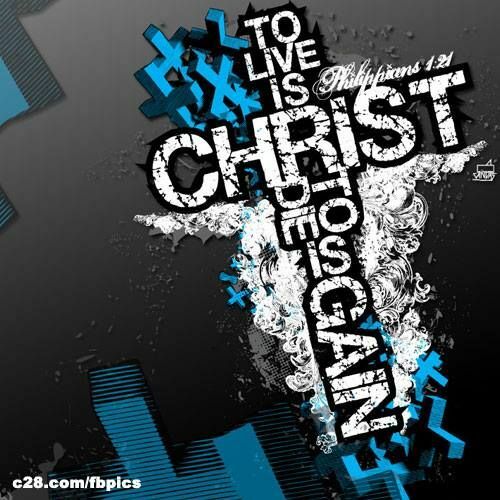 To live is Christ and to die is gain. Can we join Paul in making that declaration?